What Children Need From Parents III: Beware the Extinction Burst! Popular culture gives us just enough information to be confused. Not surprisingly, many parents who have never taken a psychology course know it is important to set limits on their children and to be consistent in enforcing those limits. Despite this, a good many parents don’t have the strength of will to withstand the repeated pleading of their kids, or the energy to do so. If your child wants you to buy him a candy bar or a toy while you are in the store, many parents believe it is simply easier to give in than to listen to the endless entreaties of their offspring. In some cases it can be too exhausting or overwhelming to have to deal with a persistent child, in other instances the parent might fear losing the child’s affection if the desired treat isn’t forthcoming, and in still other situations the parent feels guilty if he or she deprives the youngster of something. For all the reasons I’ve just mentioned, I always tell parents before they intend to change their style from one that inconsistently reinforces their child’s misbehavior, they have to be strong enough and knowledgeable enough to be prepared for what comes next. And what comes next is something pretty powerful. Let us assume your child, like the lab rat, has learned something about how you deliver reinforcers. The reinforcer could be the aforementioned candy bar or toy; it could be money; it could be your attention; it could be staying home from school; it could be a lot of things. And, let’s further assume that you no longer want the child to keep pestering you for whatever it is that he wants. Now, remember he hasn’t gotten what he wanted every time, but often enough to learn to be persistent and keep at it until you “break” under the assault. The “extinction burst” consists of the young-one doing even more of the behavior you want to eliminate at the point you stop reinforcing him. That might mean he will be louder, or pursue you longer, or repeat more often whatever has worked before. It can go on for a very long time until, finally, the child learns the lesson you want to teach him; in other words, learns he will no longer receive what he wants for his inappropriate actions. But if you finally do break down and reinforce the child with what he wants during the “extinction burst,” he will have learned an awful truth: “Well, maybe I just have to do this behavior longer or more or louder in order to get what I want.” Indeed, the child doesn’t even have to be able to think or say this to himself. Even laboratory rats operate according to the same rules of learning, and no one I know has had a very deep conversation with a rat lately. At least, not the four-legged kind. Parents sometimes tell therapists they have tried to be consistent and it failed. In other words, that the science regarding “extinction” and setting limits is inaccurate. But what has really happened in this kind of case is the parent wasn’t ready to deal with the extinction burst. Their inability to tolerate the “burst” of seemingly relentless pestering or complaining eventually led them to reinforce the child once again for the undesirable behavior; and, in so doing, made it harder to extinguish the behavior than when they started. Had the mom or dad only be able to stay-the-course and resist the child a bit longer, the “extinction burst” would have ended. The moral of the story is to prepare yourself before changing your parenting-style in an effort to become more consistent. If you aren’t absolutely sure you have the organization, energy, strength, patience, and self-confidence to withstand the “extinction burst,” don’t even try. You will only make things worse. And don’t expect your child to really believe you when you say “this is the last time I will let you do this” while you once again reinforce troublesome behavior. Talk is cheap and, like those same lab rats who can’t understand your language, your child will pay attention to what you do and not what you say. But, if you do have the requisite qualities that any good parent needs and you are fully prepared to hold your ground with your child, you might be quite pleased at how you have reasserted yourself and gotten control over the home situation. To do that, the earlier you start in your child’s life, the better. You may be interested in the following post on the topic of consistency: What Children Need From Parents II: On Slot Machines and Candy Machines. 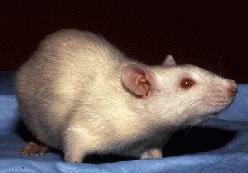 The photo of an Albino Rat was sourced from Wikimedia Commons. What a wonderful article. As the founder of the Family Sleep Institute where we help educate families to establish healthy sleep habits in their children this “extinction burst” is a critical component to a successful outcome to sleep training. I will share with my families who need clarity when we discuss how critical “consistency” is to the success of the plan. Many thanks. I’m very pleased that you think it will be helpful to those you work with. Thank you, Jadon. Can you give me the URL in question. There are an enormous number of sites that pop up on a google search. i have tried earlier and later awake times and it still doesnt make a difference. i’ve even went as far as making it only 40 m ! her cry doesnt really dwindle.. she would cry and stuff her fingers down her throat, making herself gag. its horrifying to listen to . should i just let her CIO like babywise suggests and hope that she’ll get over this hump? I have a feeling is the extinction burst or whatever. but how many extinction bursts are there even suppose to be!? In response to your last sentence, extinction can take a while. Thus, it is sometimes hard to know whether a behavior is extinguished fully since occasional repetitions of the behavior, if reinforced, can abort the attempted extinction process. Indeed, intermittently reinforcing behavior can make it harder to extinguish. I am writing all of the above to describe the process in general, not specifically about your child. For that, I suggest you speak to your pediatrician. Good luck, Rachel. Hang in there! (And thanks for your comment). My child cries when I brushing her teeth , What can I do? I’m afraid I’d need to know far more about your daughter and your family than would be possible in this format. I’d suggest you discuss this first with your pediatrician, who then might refer you to an appropriate therapist. Best wishes and thank you for your question.